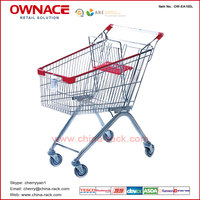 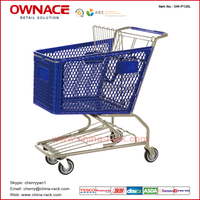 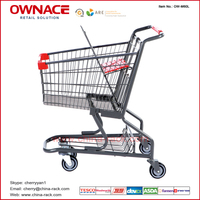 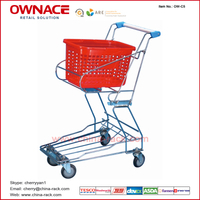 OW-AUS160 Australia Style Trolley Supermarket Shopping Trolley/Cart with Different Capacity - Buy Shopping trolley, shopping cart, shop fitting Product on Suzhou Ownace Commercial Equipment LTD.
1) Wheels:4”(100mm) or 5”(125mm)PU, PVC, Rubber or Elevator castor/wheels. 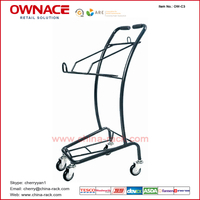 2) Customer's logo can be printed on handle bar free of charge or baby-seat. 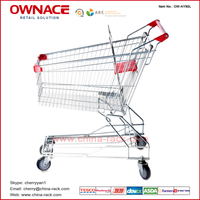 3) Trolley lock system available for coin:EUR Dollars&US Dollars or mentioned coin. 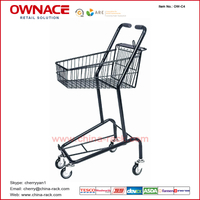 4) Anti-bumper plastic parts installed at the corner of basket to protect the trolley crash.